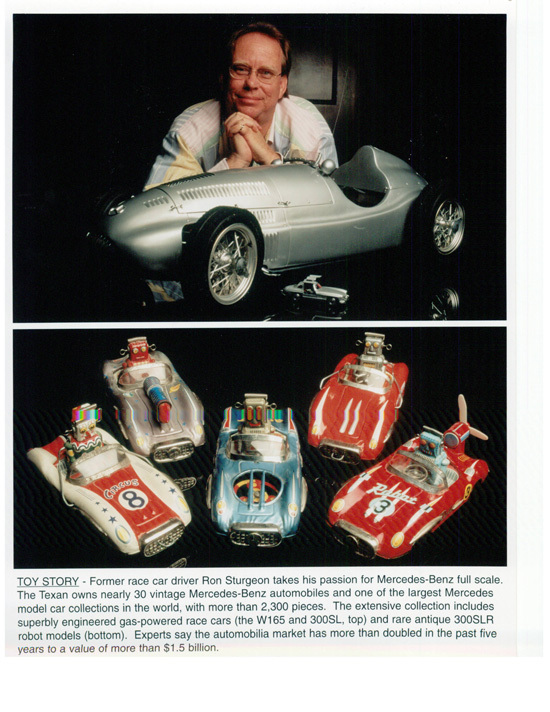 Ron Sturgeon has been collecting all types of car models for over 10 years. His collection currently contains about 3,000 models, the majority of which are tinplate Mercedes. You may have seen articles on this collection in one of several magazines. A centerpiece of the collection is a group of seven Mercedes robot cars. 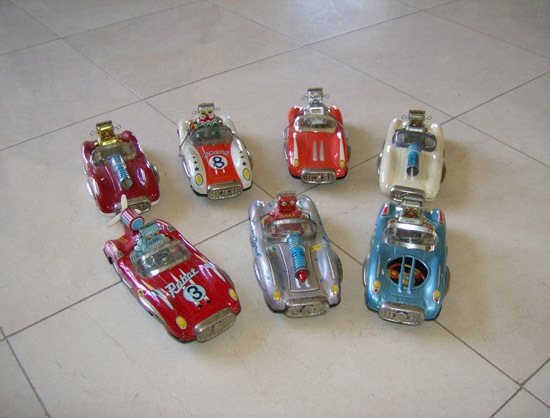 Manufactured by the Asahi Toy Company (ATC) in Japan in the mid 1950s, the cars were purchased over the years at toy shows and various auctions, in the United States and abroad. Upper row, left and right ends – basically the same model in different colors. Both have siren sound when operated and emit sparks out of the gun on the hoods. Upper row, two center cars – left one is the “Robot Circus Car #8”, right one is the “Space Patrol Car RB”. When these models run into an object the robot driver is ejected from the driver’s seat and spins on the rod. Bottom row, left – “Robot #3”, when operated it has the siren sound and the propeller spins. Bottom row, right – “Robot Space Patrol X-5”, when operated model has siren sound and the horizontal fan spins in the hood. Asahi also made this model without the robots and with a green tinted see-through roof. At a Sotheby’s auction in December 2000 robot toys from the collection of F. H. Griffith were sold. Mr. Griffith was one of the foremost collectors of space toys. 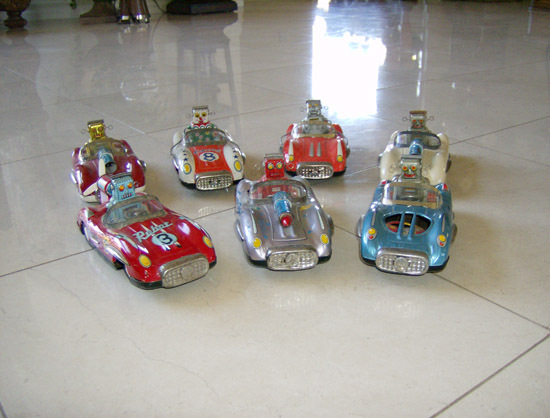 He had exactly the same seven Asahi Mercedes Robot Models in his collection.